Add 2 Nostalgic Glass Gadgets to Cart, Get $2 Off each! I love glassware.. This reminds me of depression glass. Just a beautiful set. I love the vintage look and glass is cleaner. 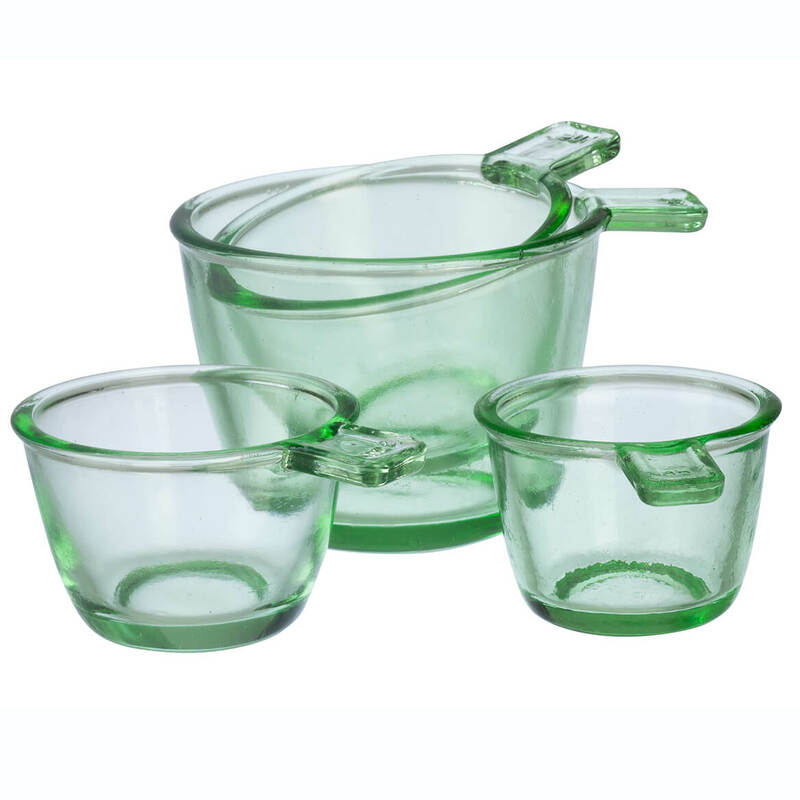 I just received the green glass measuring cups today. I bought them to replace a plastic set that has seen better days. I have not used them yet but will comment that they are pretty, and have a good solid feel to them. Liked the idea of the green glass reminding me of depression glass. And I like the different sizes rather than one cup with measurements. Great for dry measures. I always wanted this one too! Have been looking for prep bowls for measuring and I like how these look and the handles made it a no brainer. Love the way they look. I needed news ones my old ones were breaking. BEST ANSWER: Usually 'wet' measuring cups have head room allowance.....these cups are intended on being used with contents leveled off at the top of the cup. You may certainly use them for liquids but transfer of liquid would be difficult or not as accurate due to no head room at the top. Because dry and wet cups measure a little different. Dry cups are round topped and wet cups are oval topped. For true measures use the right cups. Because this particular shape is designed to measure dry more accurately, than liquid. I ORDERED THE 8 OUNCE MEASURING CUP WITH NUMERALS ON IT. IS IT STILL AVAILABLE? BEST ANSWER: Thank you for your question. Unfortunately, we were unable to determine what it was you are inquiring about. Please contact us at csr@mileskimball.com with more detail as to how we may be of help to you. We hope this information will be of help to you. 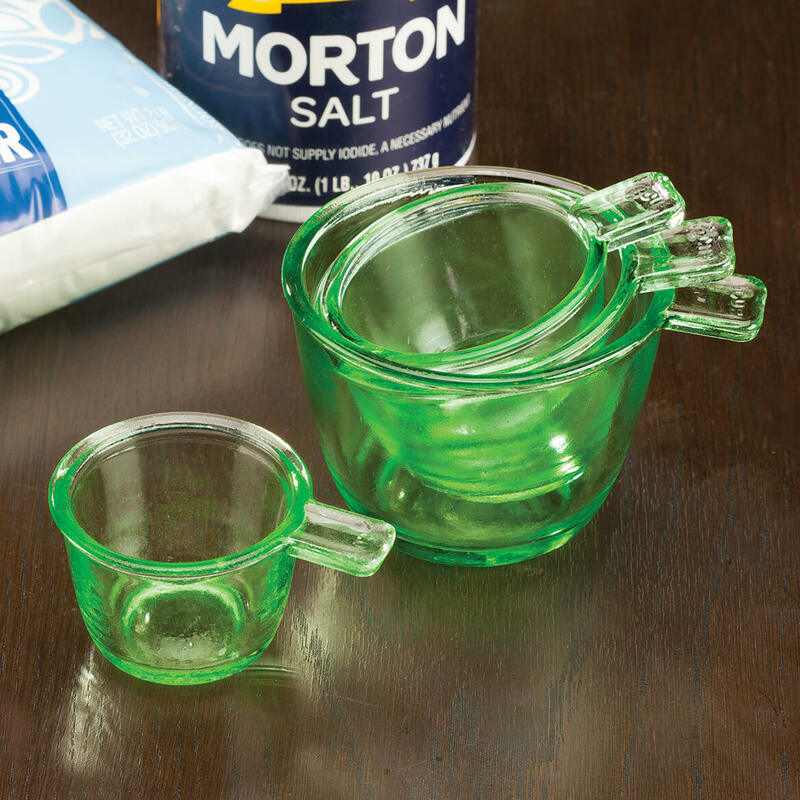 MY ORDER WAS FOR A EIGHT OUNCE FULL HANDLE PYREX MEASURING CUP IN THE GREEN NOSTALGIA COLOR. SHOWED ON YOUR WEBSITE EXACTLY AS I HAVE INDICATED.